Properties in Cheltenham average 4.6 out of 5 stars. Property 1: Traditional Cotswold Stone Cottage, Winchcombe, Cotswolds Way. Property 4: A Unique 16th Century Cotswold Stone Cottage w/parking, 2 Min Walk to Village! Property 5: A Quaint Grade 11 Listed Detached Stone Cottage In Lower Slaughter with parking. Property 12: Delightful, barn cottage in peaceful rural village. Walks, pubs, scenery. Relax! Property 20: Holiday Cottage in Winchcombe Cotswolds. Beautiful, light, airy and peaceful apartment with everything you could need for a wonderful holiday. 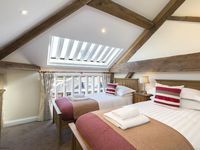 Minutes from the lovely village of Winchcombe and a short footpath walk across the field to Sudeley Castle and all the attractions it offers for children and adults alike. Highly recommend.